West Lee Street has gone through a lot of changes during the past 44 years, with old neighborhoods going to blight and gradually being replaced by the current strip of service stations, tire stores and pawn shops. Through it all, Ralph Havis and his Beef Burger restaurant have been serving burgers, fries and shakes to a cross-section of Greensboro society, from former Gov. Jim Hunt to local mayors to lunch-break workers and students of all kinds. 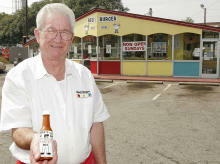 Ralph Havis, owner of Beef Burger in Greensboro, holds a bottle of “secret sauce” outside his restaurant on Lee Street in Greensboro. Havis has owned the diner since 1971 and attributes its customers’ devotion to service they receive upon visits. Havis is a fixture at the restaurant, working 10 hours each day and then returning for a couple hours in the evenings to close up shop. He can afford to hire a manager to run the store for him -- he says he has done "very, very well" in the business -- but it's just not his style. Instead, Havis handles much of the restaurant's day-to-day operations while his wife, Alma, handles the books. "When it's a small business like this, the owner has to take care of things," he says. "Meet people right, make sure the product's right. If the owner's in there and you see him back there working, you've got a good place to eat." Havis believes a restaurant's fortunes live and die on quality, so he insists on preparing the restaurant's signature items himself. Those include the chili, cole slaw and, most importantly, the secret sauce, a tangy concoction in which many of the broiled burgers are dipped before being placed on the bun. Jerry Bledsoe of Asheboro, a long-time Beef Burger fan, book author and former columnist for the Greensboro News & Record, says it's the sauce that keeps folks coming. But beyond the food, he says, there is another force at play: nostalgia. "Everybody likes institutions," Bledsoe says. "Everybody likes the comfortable. I still go by just to get a Beef Burger for old time's sake." The restaurant virtually oozes old-fashioned appeal, from the red, yellow and teal panels on the exterior to the yellow, vinyl-seated booths and vintage video games inside. Havis has consciously chosen not to modernize Beef Burger's appearance, working under an "if it ain't broke, don't fix it" philosophy. "You want people to relate to stuff that their mommas and their daddys and sometimes even their granddaddys (knew when they) were eating here," he explains. "They say, 'Come on son, I'm gonna take you to a place where I used to eat at as a kid.' I hear that all the time. People like that." Havis moved to Greensboro from Florida in 1961, when he was 18 and freshly out of high school. He took a job paying $1 per hour at the Biff Burger on West Lee Street -- one of three Gate City locations of the famous and now defunct burger chain. "Minimum wage back then was 85 cents an hour," he says, "so I thought I was moving up in the world." Havis worked as an employee at Biff Burger for the next 10 years. Along with meeting his wife there -- he says he fell in love with her when she came to the window one day and ordered a fish sandwich -- he also learned the restaurant business and how to keep customers happy. When the owner and manager at the time decided to get out of the business in 1971, he offered to sell the Biff Burger franchise to Havis and finance it for him interest-free. During the next five years, Havis paid the former owner $60,000 in monthly installments of $1,000. "That was a hard thousand dollars, too," he recalls. "This guy told me, 'When you get everything in order, try to keep at least $10,000 in the bank,'" he says. "Everybody's going to have rainy days, (and) things are going to happen that you don't have control over." It's a lesson Havis has lived by ever since, and it saved his business when a fire destroyed the roof of the restaurant in the 1970s. Biff Burger became Beef Burger in 1981. Havis decided to change the name because the Biff Burger chain had gone out of business, and he was uncertain about the legality of using the name. But Beef Burger still draws on the loyalty many customers had developed toward the parent company, Bledsoe says, and many regulars still think of it as the same old Biff. "Everybody in the know still calls it Biff Burger," Bledsoe says. Although Beef Burger may look the way it did in the 1960s, and many of the menu items have not changed, Havis says the restaurant is quite a bit different than when he started working there. "You sort of have to go with the people, whatever they come in and start asking for," he says. "You say, 'Well, I don't have it today, but we'll probably have it tomorrow.' You always got to have an open mind." Havis' willingness to try new things has resulted in a menu that might seem bewildering to a customer at a burger joint in the 1960s. The Biff Burger menu in 1961 offered 10 or 15 items, he says, whereas the restaurant's current menu offers more than 100. A few of the many items he has added to accommodate the public's changing tastes are fried vegetables of all sorts, apple sticks, macaroni-and-cheese nuggets, corn nuggets and nearly 30 milkshake flavors, including orange-pineapple, apricot and maple. Despite these and other changes, Havis says a dedication to providing good service has remained the cornerstone of the business. "If I go to a place, I want everybody's full attention," he says. "If somebody's good enough to come into your place, you've got to treat them with respect and try to get them their food as fast as possible." Some of Beef Burger's nine employees have been with Havis for several years and are as dedicated to customer service as he is. One of those employees is Pat Ellison, who has worked at the restaurant off and on since 1971. "(They) get good service, and we care about them," she says of Beef Burger customers. "We make sure every order is right before it goes out." Havis says that same attention to detail has gone into every one of the thousands of orders he has filled over the years. When asked to speculate how many that might be, he declines to guess, instead saying with a knowing smile: "McDonald's does the counting. We deal in making people happy and having a good product."